What you cannot measure, you cannot improve! With increased data usage and downloads over smartphones and the internet, CSPs are struggling to measure customer experience. As a result, they are rolling out new networks and multiple service delivery to make sure that their overall customer experience across devices and platforms remains unaffected. CSPs have realised that customer experience management (CEM) is not just about improving network performance, but it is host of other things including analytics that go beyond networks. TCTS has a reporting tool called “CEM Dashboard” that effectively measures customer experience. 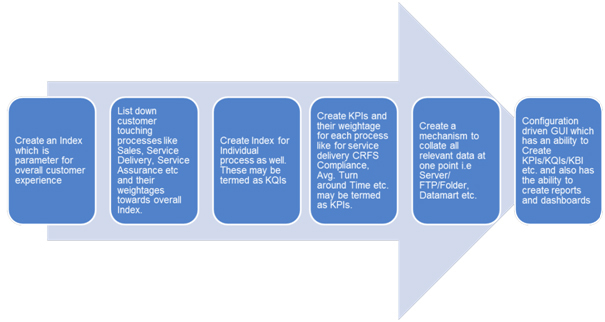 The tool is built on hierarchical principle of key business indicators (KBI) being derived from key quality indictors (KQI) and KQIs are derived from key performance indicators (KPI). While KBI measures top line improvement, KQI measures network quality, ease of service, touch point experience, etc. KPI breaks down network quality into voice quality, call drop, etc.